Measure and keep all ingredients ready. Dry roast toor dal in a medium low flame until golden brown. 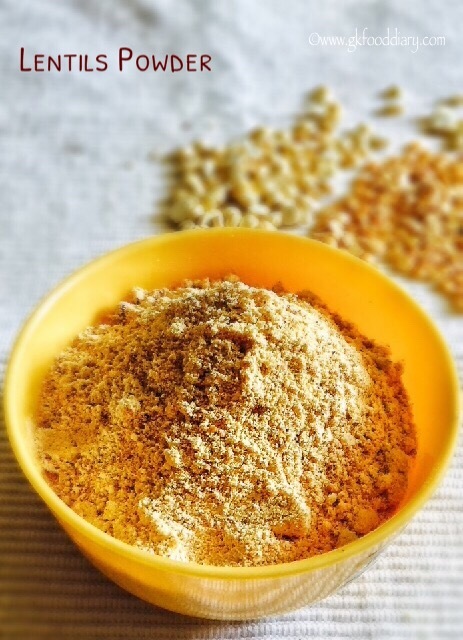 When the toor dal is slightly golden brown, add hing and cumin seeds. Mix well. Remove from the pan and set aside. In the same pan, Dry roast fried gram dal in a medium low flame until hot to touch. Remove from the pan and set aside. In the same pan, Dry roast garlic cloves in a medium low flame until hot to touch. Remove from the pan and set aside. In the same pan, add ½ tsp of oil and fry red chillies for a minute. Remove from the pan once done. Once all the roasted ingredients are cooled down, add everything to a blender along with salt . Blend all together to a fine powder. Transfer the lentils powder to a plate and spread it. Cool it down and store in a air tight container.